Trailer hitches attach the rear of the Slingshot's frame and allow it to tow small trailers. 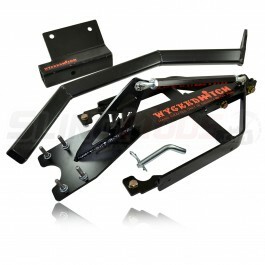 Trailer hitches for the Slingshot are specially engineered to support the weight of properly proportioned trailers. They are made from steel alloy and are an ideal purchase for anyone looking to take their Slingshot on long trips with an abundance of baggage. Trailer hitches for the Slingshot are composed of several pieces which can be separated when not in use to cut down on weight and bulk.